This set is absolutely beautifull. It is shiny which give it a sense of luxury and elegance. I bought it for my son's bedroom and I had it for almost 3 years and still looks like new. I can't find one like this so I keep coming to the website trying to find a new one to replace it with and I still end up liking this one. To add a touch of richness to your current décor, the Princeton Coverlet Set can update your room in seconds. Made from polyester jacquard, the coverlet and shams share leaf, striping and medallion motifs that are accentuated by channel stitching on a chocolate brown base. Pops of blue are also used throughout this collection adding a lavish feeling to your decor. Two decorative pillows feature pleating and embroidery details that correspond back to the coverlet to bring this entire look together. Love the color and great quality. Could be one inch wider for our king bed. I bought this for my bedroom in Florida because comforters are too heavy. It was exactly what I was looking for a blue and dark brown quilt! This is a great weight for a quilt. It is so much more beautiful in person.. The designs are gorgeous. 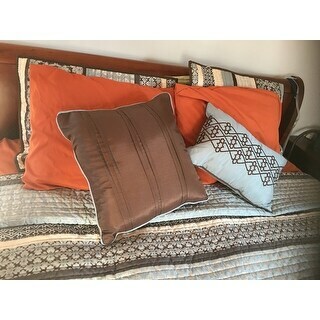 The Browns are true dark browns and the blue is a softer yet vibrant color so pretty with the brown and taupe the brown toss pillow is the same true brown as the quilt. I put a dark brown bed skirt with it. It has the look of being so much more expensive.. I even got to use my taupe euro pillows and a toss pillow from my last bed set. Looks great, so satisfied. It did however have a smell to it when I first took it out of the bag. Kind of smelled like it got wet or was in a wet room. I put in the dryer with lavender dryer sheets and sprayed the quilt and pillows several times with frebreeze lavender let dry completely , repeated several times and the smell finally left the quilt and pillows. Trust me, I have the best nose for smelling bad smells and could not have kept it if it did not go away. I even bought another one to save for later and another in a different color for a Christmas gift for a friend.. You will not be disappointed. This coverlet is beautiful. It is soft, has a subtle sateen finish and complimentary colors. I bought the king and the size is perfect as it hangs down the sides about 10 inches. It looks nice on the bed but I ordered a KING and it is a little short in width for the bed, and a bit long for the length. Of course I have a foam pillow top on the mattress but it is not that thick, maybe a 1/2 inch. Overall pleased with the color and quality. I have a guest room with a double bed that should have a dust ruffle to cover the box spring and bedframe. I don't like dust ruffles. So I purchased a queen size 90 x 90. It fits perfectly and I don't need a dust ruffle. The colors are true to the picture and material is quality. I live in FL so I don't need a heavy comforter. This coverlet is perfect. I looked through the stores around here and could not find anything I like. Love this pattern. This coverlet set is perfect for warmer months. It is very soft and nicely made. It is not a cheap, lumpy mess like some I have bought. And it is not the scratchy polyester that is out there. The colors are very nice and pretty much spot on to what is on the screen. We have a queen size sleigh bed and this coverlet is PERFECT ! Not too long on the side. SO, if you have a normal queen bed you might want to size up. 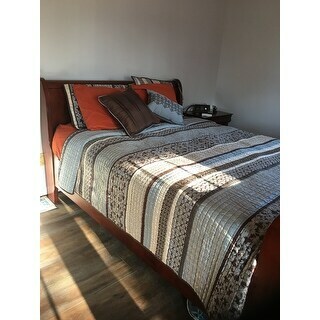 I paired this coverlet with a nice RUST colored sheet set and it look very pretty. I have attached some pictures and the pillow shams look flat because I need better pillow inserts for them. I have a few other tweeks I want to do to make it look a little more polished but all in all I am very happy with this purchase and would definitely consider this brand for future purchases. I purchased the Madison Park Whitman Blue Jacquard Bedspread Set for the winter months and loved the variations of blues and browns in the pattern, When I saw this lighter weight coverlet set it was perfect. it matched the drapes I have already and of course my Safavieh Handmade Soho Modern Abstract Rain Blue Wool Rug (6' x 9') goes perfectly as well. I feel peaceful when I walk into my bedroom. Overstock helped me decorate it, but I brag about putting all items together for a complete look ! The Madison Park Harvard coverlet set looks as expected from the pictures. It is pretty, yet the colors are masculine enough to be great for a master or guest room. The blue is a gray/blue, the brown is definitely a dark espresso, and the light color is an off-white or cream color. The material feels like it will snag very easily, so I'm being cautious with it. It is definitely a light weight coverlet vs a heavier thicker comforter. 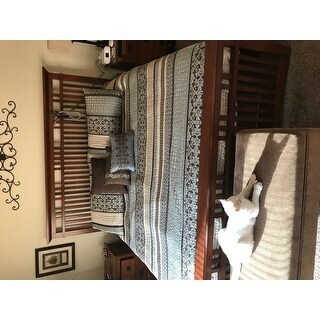 We have a queen sleigh bed with sideboards, and the queen coverlet set is the correct size - it hangs down to just a bit below the top of the wood. If we didn't have the wood sideboards, I would definitely have wanted a larger size. I did not rank this this a five star, as there were many end threads hanging out across the entire coverlet that needed to be snipped. Overall I'm quite pleased with this purchase. This coverlet set is very rich looking, light weight........actually better looking than the picture. I am extremely happy with it. I bought this one for one of my daughters. They're all very picky women. But thanks to overstock .com I was very loved this year! These quilts are wonderful gifts. But they are also, very hard to part with. Coverlet set was exactly as pictured on line. Very satisifed with the quality and the cost of the set. Fabric is shiny and not the casual look I wanted. Nice colors. Very nice coverlet and shams. Love the quality. Very happy with my coverlet, shams and extra pillows. Just as pictured and the size is perfect. I am always happy with my purchases from Overstock.com. This works perfectly for our king size platform bed. The material is soft and "tuckable" under the mattress so the drawers on the side of the bed and the woodwork is readily accessible and viewable. Very pleased with the colors, which are true to the picture and looks amazing with the dark walnut of our suite. An excellent value. This is a beautiful set - but I am finding that the stitching comes apart (gets pulls in it) very easily. I love the look but not sure how long it will last. Update, this one lasted less than a year in a room that wasn't used very frequently. The stitching completely unravelled. I do not, unfortunately, recommend. I love this on my bed. I wish I could have had some options on curtains to choose from to match. Excellent comforter! Very lightweight yet warm. The colors matched beautifully in my bedroom. I even have a couple of dogs who like to jump up on the bed, yet this comforter has held up nicely. Beautiful! I just noticed I haven’t reviewed this. I’ve had this bedspread for at least 2 years... maybe more and I still absolutely love it! It was exactly what I was looking for. The colors and quality are great. Delivery was timely. Is a nice and comfort set. The color and pattern is nice. I love the weight of it. It does snag. I also with they had matched the pattern on the pillow shams so they are the same. They are not. Really impressed with this quilt. A little heavier than our last one. Colors are very beautiful and the extra throw pillows make the bed look elegant. "The pillows look like they are the shiny material, is the comforter the same way?" The mostly blue and mostly white pillows are shiny but not shiny like a satin material is. The comforter is not as shiny as the pillows. The comforter has some of the shiny material sewn within the cloth material. I would not consider it being shiny. I love mine. "Does this have a shiny look to it"
The comforter has some of the shiny material that you see on the blue and white pillow sewn within a normal cloth material, but it's not as shiny as a satin material is. I would not consider it being shiny. I love mine. "what does the reverse side look like? Is it the same pattern or a solid color?" "Does this only come in the Blue/Brown colors?" Yes, it is currently only available in the color shown. "Looking for a brown dust ruffle to match my king set. Is there one you can recommend that is a good match?" Wow, Overstock hid the answer. I get that you want people to buy from your site, but REALLY? The Merit premium pleated bedskirt in chocolate matches great. "Is the blue a true light blue? I am searching for a more light aqua with brown combo, but I love this pattern! Any help appreciated." I would say aqua but it changes in different light. I have purchased this item and have been very satisfied. The blue is a true light blue. Not aqua. Very nice quality and very pretty colors. "Are California king size bed bigger than regular king size bed ?" The CA King measures 72 inches wide x 84 inches long. The King measures 76 inches wide x 80 inches long. 76 X 80 is not large enough for a king bed. I need 110"L x 110 "W minimum to fit my King size bed. I just returned a spread that was 90" X 104"; it was short on length and width.